My trip to North Carolina to attend the East Coast Games Conference in Raleigh last week was a ruse, a feint. My real target was a (mostly) unassuming office structure in the Raleigh suburb of Cary, the birthplace of some of the greatest games of the past decade. The company that was once Epic Megagames moved from Maryland to North Carolina in 1999, a year after changing the face of the first-person shooter with Unreal. The game engine that powered that multiplayer classic, the Unreal Engine, took on a life of its own, its three iterations providing the framework for hundreds of titles, from Microprose's 1998 Star Trek: The Next Generation: Klingon Honor Guard to En Masse Entertainment's massively multiplayer online game Tera, launching tomorrow in North America. Of course Epic Games continues to make its own hit titles as well. The Gears of War trilogy is one of the biggest franchises on the Xbox 360, granting design director Cliff Bleszinski the superstar developer status the creator of Jazz Jackrabbit so richly deserves. That's Cliff's office up top, looking very much like my own desk at home, only more expensive. A fellow Transformers fan, his shared workspace features not one but two Fortress Maximus figures, perhaps the most coveted of all figures in the series' history. I may have licked one of them; I'll never tell. Who'd have thought I'd find a haven for the bot-lover inside this relatively non-descript office building? There isn't much in the lobby of the Cary, North Carolina office that would hint that this was the birthplace of an entire generation of video games; I suppose that's to keep the riffraff out, a security measure I bypassed thanks to Epic's Dana Cowley, who graciously offered to guide me through the maze-like corridors. Corridors filled with cases of awards, swag, and memorabilia. Aside from the cases of toys, games, trophies and guns, the first real indicator that there's something special going on here is, oddly enough, a simple sign on the wall near the lair of Epic's legal department. Not quite as impressive as it was in the cartoons, but less likely to be invaded by the Legion of Doom. Dana led me through the cafeteria area, where an impressive array of beverages in humming gas station-style coolers was free for the taking. A long counter in the center of the kitchen area would be filled with hungry developers on my way back through, scarfing down barbecue on tables arranged in the shadow of a looming indoor rock-climbing wall. And then there's the slide. More on the slide later. From there Dana led me into the building's cavernous motion capture studio, home of the roadie run. It's also the home of a pile of NERF weapons and a mannequin that's seen better days. Those colorful NERF guns lie discarded in the corner due to a recent addition to the mocap setup, a set of 'lifelike' firearms, weighted so that actors carry them properly. One does not simply grab one of these weapons and casually wave it about. Well, unless you're Dana Cowley. From the motion capture studio I was led upstairs to the rec room, an arcade overlooking the cafeteria, where a pair of employees were engaged in a fierce ping pong battle amidst classic arcade cabinets. ...to the neat and tidy office of President Mike Capps. And then of course there's Cliff's place, the room I could happily die in. 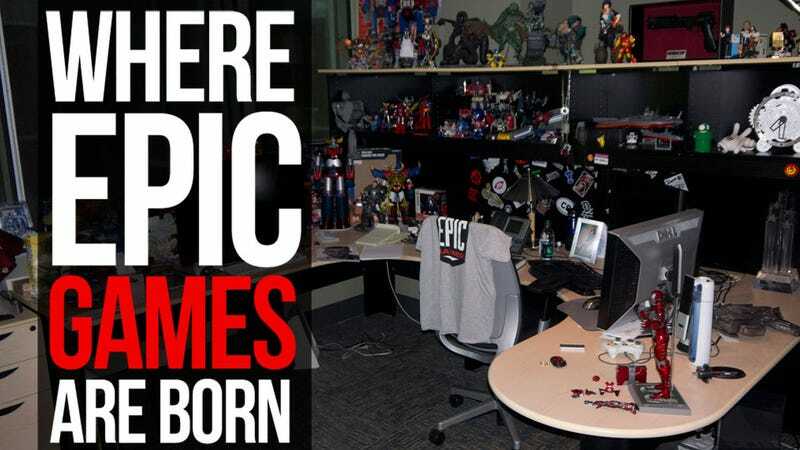 Between the cafeteria, Cliff's office, and the company's extensive library of manga, video games, and comic books, Epic headquarters is the place I'd head for if the zombies attacked. It might not be properly fortified, but with the development team behind Fortnite in the house I'm sure we could come up with something. It's the perfect environment for creative gaming professionals. They just need to do something about the lawn decorations.